Crest Builder expects exciting next two years. 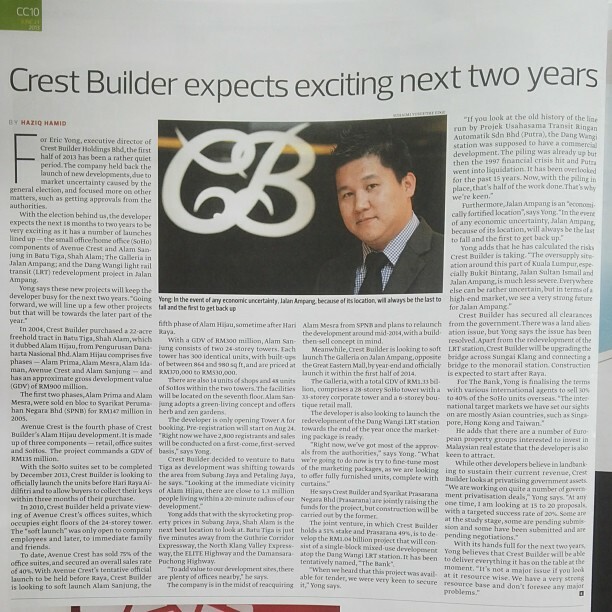 FOR Eric Yong, executive director of Crest Builder Holdings Bhd, the first half of 2013 has been a rather quiet period. The company held back the launch of new developments due to market uncertainty caused by the general election and focused more on other matters, such as getting approvals from the authorities. With the election behind us, the developer expects the next 18 months to two years to be very exciting as it has a number of launches lined up — the small office/home office (SoHo) components of Avenue Crest and Alam Sanjung in Batu Tiga, Shah Alam; The Galleria in Jalan Ampang; and the Dang Wangi light rail transit (LRT) redevelopment project in Jalan Ampang. Yong says these new projects will keep the developer busy for the next two years. "Going forward, we will line up a few other projects but that will be towards the later part of the year." In 2004, Crest Builder purchased a 22-acre freehold tract in Batu Tiga, Shah Alam — which it dubbed Alam Hijau — from Pengurusan Danaharta Nasional Bhd. Alam Hijau comprises five phases — Alam Prima, Alam Mesra, Alam Idaman, Avenue Crest and Alam Sanjung — and has an approximate gross development value (GDV) of RM900 million. The first two phases, Alam Prima and Alam Mesra, were sold en bloc to Syarikat Perumahan Negara Bhd (SPNB) for RM147 million in 2005. Avenue Crest is the fourth phase of Crest Builder's Alam Hijau development. It is made up of three components — retail, office suites and SoHos. The project commands a GDV of RM135 million. With the SoHo suites set to be completed by December 2013, Crest Builder is looking to officially launch the units before Hari Raya Aidilfitri and to allow buyers to collect their keys within three months of their purchase. In 2010, Crest Builder held a private viewing of Avenue Crest's offices suites, which occupies eight floors of the 24-storey tower. The "soft launch" was only open to company employees and later, to immediate family and friends. To date, Avenue Crest has sold 75% of the office suites, and secured an overall sales rate of 40%. With Avenue Crest's tentative official launch to be held before Raya, Crest Builder is looking to soft launch Alam Sanjung — the fifth phase of Alam Hijau — sometime after Hari Raya. With a GDV of RM300 million, Alam Sanjung consists of two 24-storey towers. Each tower has 300 identical units with built-ups of between 864 and 980 sq ft and are priced at RM370,000 to RM530,000. There are also 14 units of shops and 48 units of SoHos within the two towers. The facilities will be located on the seventh floor. Alam Sanjung adopts a green-living concept and offers herb and zen gardens. The developer is only opening Tower A for booking. Pre-registration will start on Aug 24. "Right now we have 2,800 registrants and sales will be conducted on a first-come, first-served basis," says Yong. Crest Builder decided to venture to Batu Tiga as development was shifting towards the area from Subang Jaya and Petaling Jaya, he says. "Looking at the immediate vicinity of Alam Hijau, there are close to 1.3 million people living within a 20-minute radius of our development." Yong adds that with the skyrocketing property prices in Subang Jaya, Shah Alam is the next best location to look at. Batu Tiga is just five minutes away from the Guthrie Corridor Expressway, the North Klang Valley Expressway, the ELITE Highway and the Damansara-Puchong Highway. "To add value to our development sites, there are plenty of offices nearby," he says. The company is in the midst of reacquiring Alam Mesra from SPNB and plans to relaunch the development around mid-2014 with a build-then-sell concept in mind. Meanwhile, Crest Builder is looking to soft launch The Galleria on Jalan Ampang — opposite the Great Eastern Mall — by year-end and officially launch it within the first half of 2014. The Galleria, with a total GDV of RM1.33 billion, comprises a 28-storey SoHo tower with a 33-storey corporate tower and a 6-storey boutique retail mall. The developer is also looking to launch the redevelopment of the Dang Wangi LRT station towards the end of the year, once the marketing package is ready. "Right now, we've got most of the approvals from the authorities," says Yong. "What we're going to do now is try to fine-tune most of the marketing packages, as we are looking to offer fully-furnished units, complete with curtains." He says Crest Builder and Syarikat Prasarana Negara Bhd (Prasarana) are jointly raising the funds for the project, but construction will be carried out by the former. "When we heard that this project was available for tender, we were very keen to secure it," Yong says. "If you look at the old history of the line run by Projek Usahasama Transit Ringan Automatik Sdn Bhd (Putra), the Dang Wangi station was supposed to have a commercial development. The piling was already up but then the 1997 financial crisis hit and Putra went into liquidation. It has been overlooked for the past 15 years. Now, with the piling in place, that's half of the work done. That's why we're keen." Furthermore, Jalan Ampang is an "economically-fortified location," says Yong. "In the event of any economic uncertainty, Jalan Ampang, because of its location, will always be the last to fall and the first to get back up." Yong adds that he has calculated the risks Crest Builder is taking. "The oversupply situation around this part of Kuala Lumpur — especially Bukit Bintang, Jalan Sultan Ismail and Jalan Ampang — is much less severe. Everywhere else can be rather uncertain, but in terms of a high-end market, we see a very strong future for Jalan Ampang." Crest Builder has secured all clearances from the government. There was a land alienation issue, but Yong says the issue has been resolved. Apart from the redevelopment of the LRT station, Crest Builder will be upgrading the bridge across Sungai Klang and connecting a bridge to the monorail station. Construction is expected to start after Raya. For The Bank, Yong is finalising the terms with various international agents to sell 30% to 40% of the SoHo units overseas. "The international target markets we have set our sights on are mostly Asian countries, such as Singapore, Hong Kong and Taiwan." He adds that there are a number of European property groups interested to invest in Malaysian real estate that the developer is also keen to attract. While other developers believe in landbanking to sustain their current revenue, Crest Builder looks at privatising government assets. "We are working on quite a number of government privatisation deals," Yong says. "At any one time, I am looking at 15 to 20 proposals, with a targeted success rate of 20%. Some are at the study stage, some are pending submission and some have been submitted and are pending negotiations." 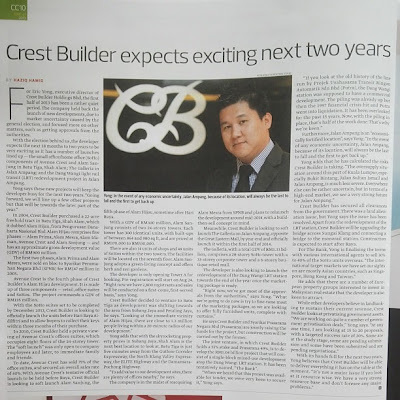 With its hands full for the next two years, Yong believes that Crest Builder will be able to deliver everything it has on the table at the moment. "It's not a major issue if you look at it resource wise. We have a very strong resource base and don't foresee any major problems." This story first appeared in The Edge weekly edition of June 24-30, 2013.